NASA’s latest mission to Mars has reached a major milestone, with the ‘InSight’ (Interior Exploration using Seismic Investigations, Geodesy and Heat Transport) lander touching down on the red planet on 27 November at around 7 am AEDT. Launched from California back in May on an Atlas V launch vehicle, the lander was in flight for over six months, covering a distance of 485 million kilometres at a speed of over 10,000 km/h. It is the first outer space robotic explorer to study in depth the ‘inner space’ of Mars — its crust, mantle and core — as well as measuring tectonic activity and meteorite impacts. Professor Domenico Giardini and his group at ETH Zurich’s Aerospace Electronics and Instruments Laboratory delivered a highly specialised electronic control and data acquisition system to be integrated into the lander’s SEIS (Seismic Experiment for Interior Structure) seismometer, which is now being prepared for deployment to measure ‘marsquakes’. Together with seismologists from the Swiss Seismological Service, the group will run a marsquake service charged with the analysis and characterisation of the data from the seismometer. The key aim is to use the seismometer to record waves released from marsquakes triggered by meteorite strikes. From these seismic measurements, researchers can make deductions about the red planet’s inner structure and composition — and draw conclusions about the formation and history of Mars and other rocky planets in the solar system, including the Earth. The InSight lander is spending a few days recording images of its surroundings with its Instrument Deployment Camera and Instrument Context Camera, utilising colour CCD image sensors provided by digital imaging company Teledyne DALSA. The camera on the lander’s robotic arm will provide 3D colour views of the landing site, instrument placement and activities to inform engineers and scientists of the best spots for the seismometer and heat flow probe to gather measurements from the interior of Mars. These instruments will then be placed on the surface with the aid of the robotic arm, ready to start taking marsquake measurements in January 2019. Data will be transmitted to Earth twice each Martian day until the completion of the mission in November 2020. The Instrument Deployment Camera (IDC) located on the robotic arm of the InSight lander took this picture of the Martian surface on the day the spacecraft touched down on the red planet. Image credit: NASA/JPL-Caltech. May was a significant month for NASA not only due to the launch of InSight, but also because the agency was able to successfully reactivate the drill of its Curiosity rover. Inoperable at this point for well over a year, the drill may not have been so easily fixed were it not for events that had taken place 18 years previously. In the year 2000, NASA’s Jet Propulsion Laboratory (JPL) commissioned sensor manufacturer FUTEK to develop space/flight qualified cryogenic three-component sensors for its then-upcoming Mars mission. As the robotic arm manoeuvres, the multi-axial sensor provides feedback to the operating device identifying the levels of torsion and force applied. Cut back to 2018, and NASA’s engineers needed to find a way to continue the drilling on Mars — a vitally important part of Curiosity’s capabilities to study the red planet. After testing many different options, the solution came in the form of a newly created technique called feed-extended drilling (FED), using the FUTEK multi-axis force sensors already located in the robotic arm to push the drill bit forward as it spins — a bit like how a human would while drilling into a wall. In mid-May, Curiosity successfully drilled a 50 mm-deep hole in a target called ‘Duluth’, capturing its first rock sample since October 2016. The sample was subsequently delivered to two laboratories located inside the rover, which are able to conduct chemical and mineralogical analyses of rock and soil samples. With both missions now on track, it’s only a matter of time before they deliver new and exciting insights into a planet that has fascinated mankind for so many years now. 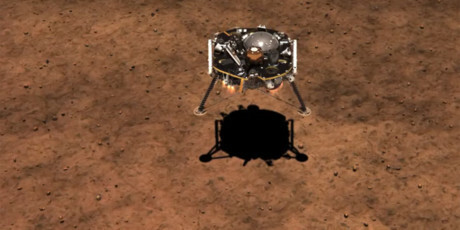 Top image caption: Visualisation of the touchdown of the InSight lander on Mars. Image credit: NASA.